Can you believe summer is nearly here? 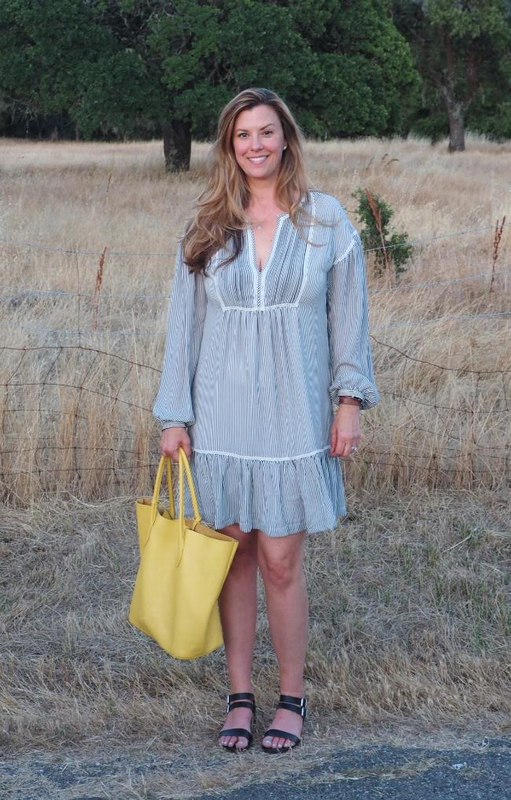 With the official start of the season only days away, Adrienne of The Rich Life in Wine Country thought it was a great time to focus this month’s “How I Wear My” on vacation or resort looks. This was one of those posts that was a pleasure to put together because of all the photos that were sent in, featuring so much color! I hope you get a lot of ideas for looks that are ready to take a trip this summer. I know I did. Enjoy! I love this kind of easy summertime style on Adrienne, a season that definitely calls for throw on and go outfits. I especially like that she paired this look with a yellow bag! April of Ms. B in the Bay Area. What a great look on April. I like that she added a hat and bold silver jewelry. I love this dreamy look on Jodie (she looks so beautiful!) and I love that the whole thing was made up! I hope she gets to go to Hawaii for real and packs this exact ensemble. Hello, Island Hottie! 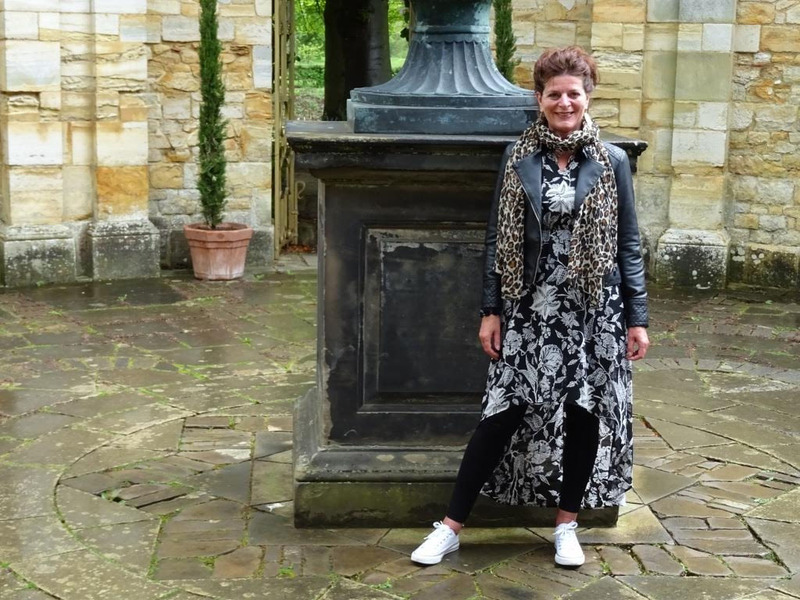 I love the mix of patterns and that she added leggings, a leather jacket, a leopard scarf, and white sneakers. I love turquoise in summer so I think it’s great that Dawn Lucy mixed the top with a black skirt. 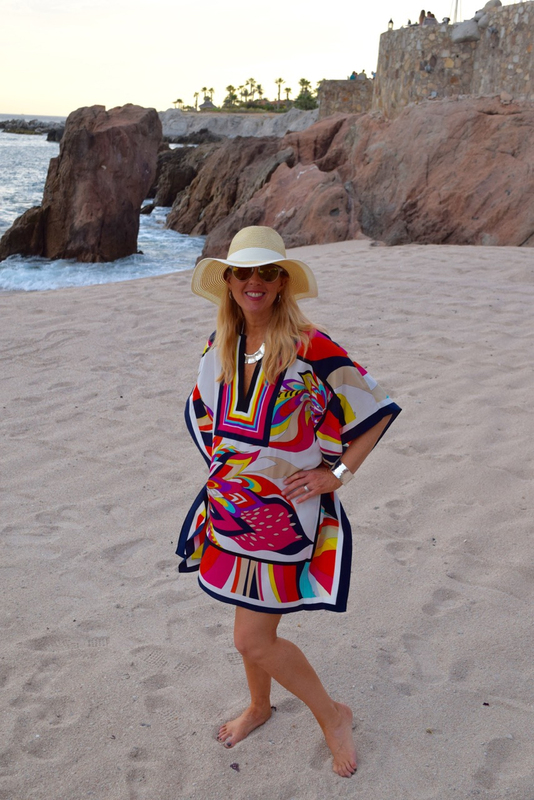 The multicolor bag, hat and jewelry add a wonderful beachy vibe! If you are wondering who the poolside babe is, it’s our friend Catherine of Not Dressed As Lamb, looking so glamorous in a print caftan by Asos and a white bikini just visible underneath. Wowza! She wore this look in Greece last year and I can imagine that she turned many heads with it! Just gorgeous. 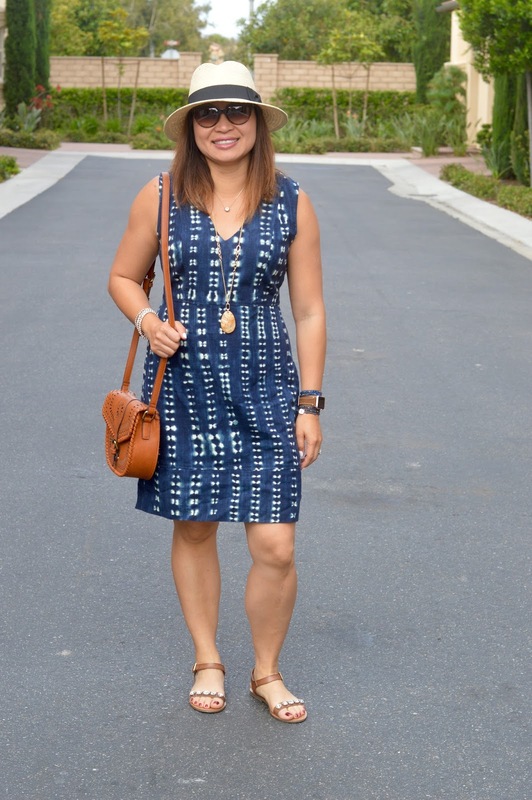 Such a great print on Alice and I am especially loving her jewelry and embellished sandals! I love that this is a basic look that Trina has amped up with jewel-toned leopard print! Nicole brings up a great point about keeping a vacation wardrobe simple and 100% mixable—and keep it close at hand! I love that she went for some major print mixing here. And hello legs! I really like this mix of colors on Ana and if I had legs like hers I would be wearing shorts everywhere, all the time! This is a look I’d like to try this summer. I am especially crazy for Linda’s popcorn tote, it’s so cool and I would want to take it with me to the movies and everywhere else! Oh I know the weekend Rena is talking about, it was snowing here in Brooklyn too, and I found it extremely annoying. My first thought was that the cold would kill all the flowers, especially the forsythia! 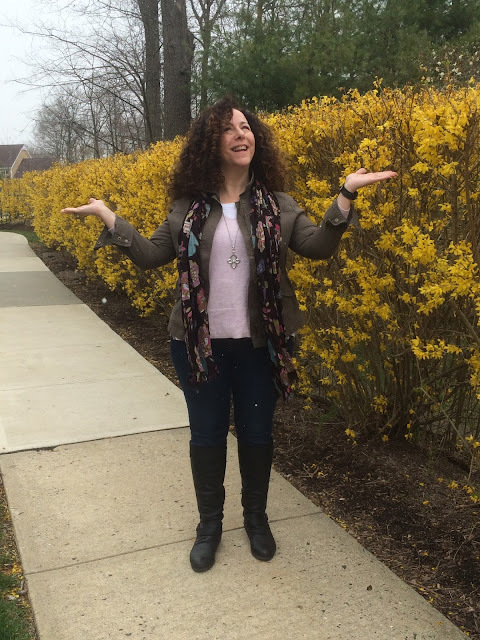 I love this shot of a happy Rena surrounded by all this lovely yellow and her traveling outfit was ideal for both April and the tri-state area! 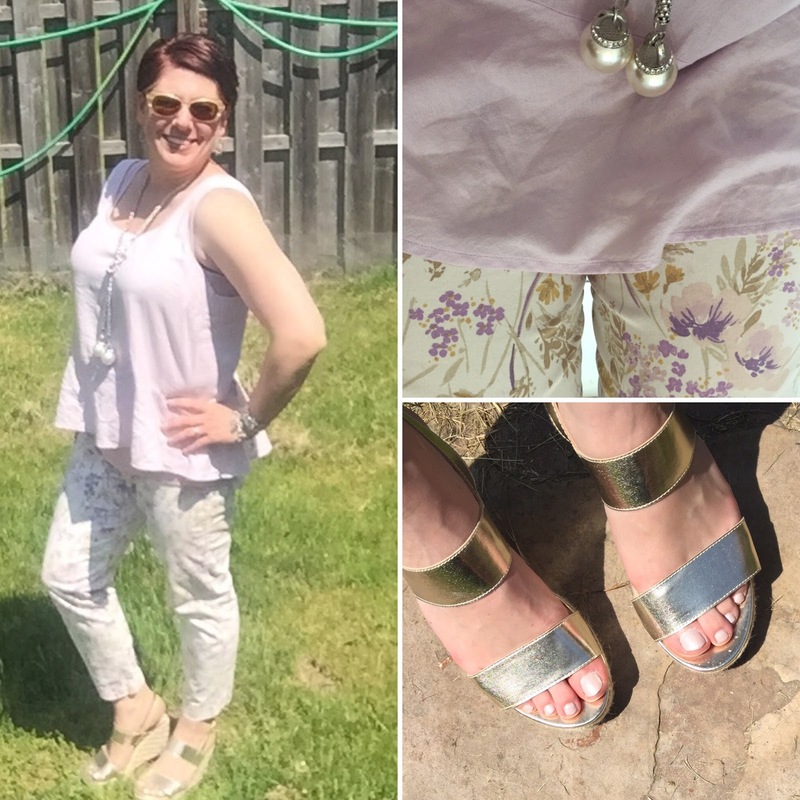 I love these pale colors on Shelbee, especially that she paired them with an unusual pearl necklace, and I am so glad to see I am not the only one still thinking about metallic shoes! I like these in gold (with a lovely shimmery neutral pedicure) and wow, $1.50? What a steal. How lucky Jacqueline is to be able to go on an amazing trip for her 50th. Happy Birthday, Jacqueline! You know we are obsessed with jewelry these days here at EJS, so I wanted to include a detailed shot of Jacqueline’s necklace, which I am crazy for, especially against pale yellow and the delicate broderie anglaise blouse, which I adore. I love this necklace on Jacqueline! Maryna shares another photo of herself in Italy (so lucky!) and I really like this palm tree print on her. I hope she gets to travel through more of Italy this summer and brings this dress with her! 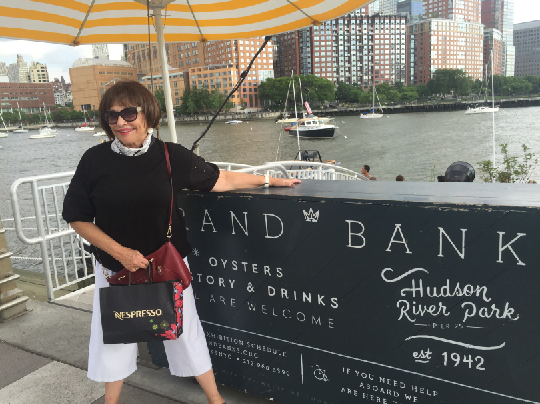 My good friend Rosie enjoyed cocktails earlier this week in Manhattan at the Grand Banks Barge in SoHo, right on the Hudson River. Lucky lady! She is wearing white cropped Eileen Fisher pants, a Uniqlo black cotton top with eyelet sleeves, a small black & white Hermès scarf (love it), and white agate and mother-of-pearl earrings. Her handbag is by Coach. I never get tired of black and white and I especially love it in the city in summer, particularly in this way—black top, white pants. The locale looks so refreshing, don’t you think, with the striped yellow umbrella, and the boats in the background. I need to check this place out myself! I never think I like tie-dye and then I see a top like this and know I need to rethink my position! I love the casual glamour of this look on Susan, amplified by the big gold cuff and earrings (love). The lush background suggests she was at a museum and I would love to know which one since I like that sculpture behind her! I am crazy for turquoise any time of the year, but particularly in summer and especially with white! I love that Nora has shown us four different ways to style the same item. My favorite is the top right, as a shawl. Which one do you like best? Michelle of RetroChicMama. This photo belongs in Vogue! I love the ethereal quality of both the photos and the dress, don’t you? They seem like something straight out of Vogue! I love the clean aesthetic and delicate details of this dress. I love the back of Greetje’s blouse, which you can see below, and I also like her necklace and red bag! 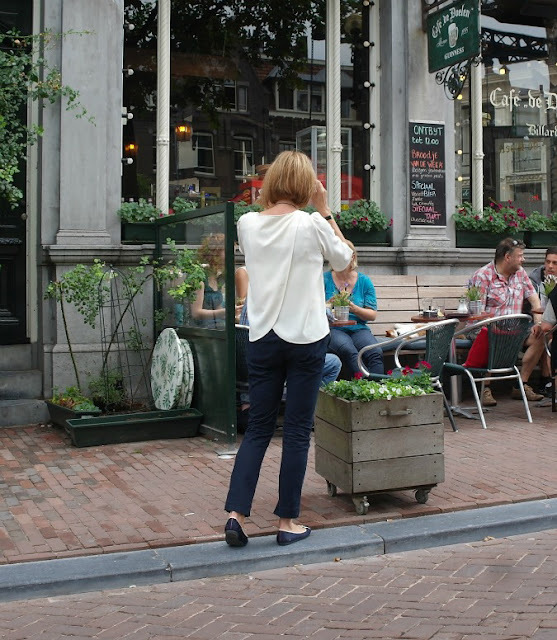 The back of Greetje’s blouse provides great visual interest! My vacation plans are usually thrown together at the last minute, and going to a resort does not seem like it will happen anytime soon, but one of the advantages of living in NYC is knowing I can always get away to places like the Met or the New York Antique Jewelry & Watch Show. For those times, I like a casual but polished look. 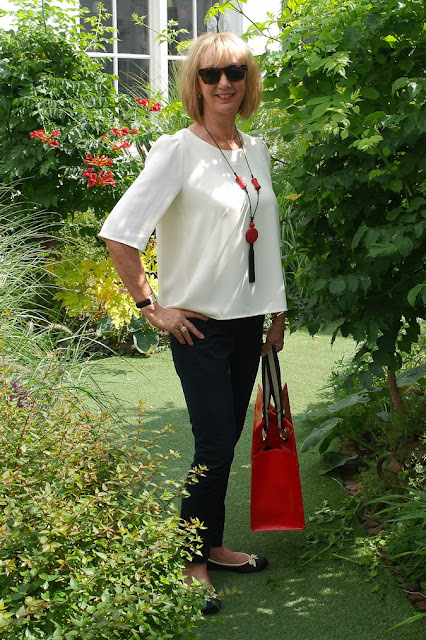 I’m wearing Old Navy white jeans, a striped top from Target, Kelly & Katie sandals, a Duchessa Jewels necklace and the Elizabeth Taylor bag I first showed for “How I Wear My: Tote.” I can’t wait to hit the road with Liz soon! 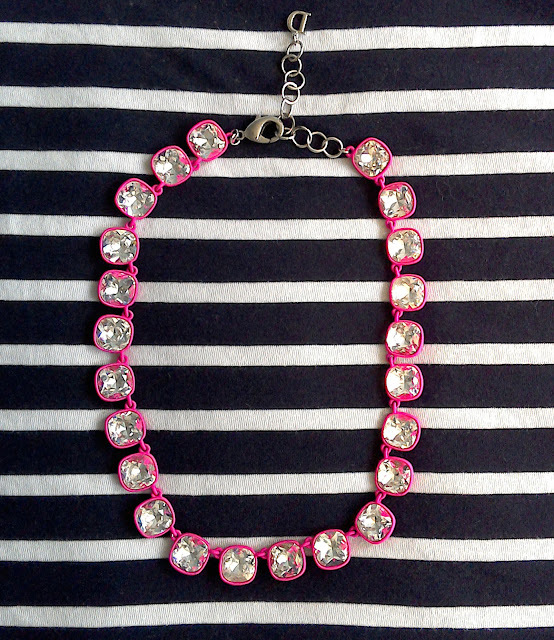 I love this Duchessa Jewels necklace with navy and white! 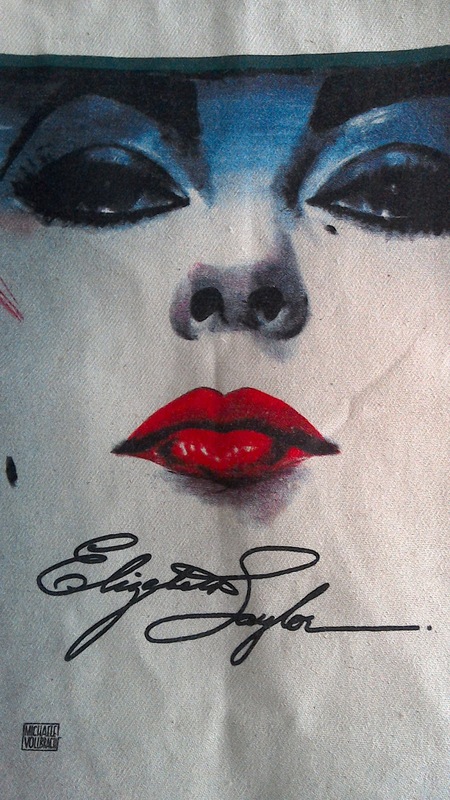 My eBay special featuring Elizabeth Taylor. Liz and I have places to go! Happy travels to you this summer, no matter where you are headed! 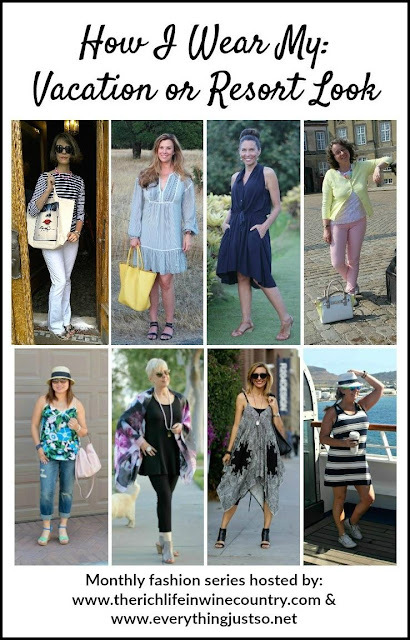 For July, Adrienne and I chose Tunic as the “How I Wear My” theme. 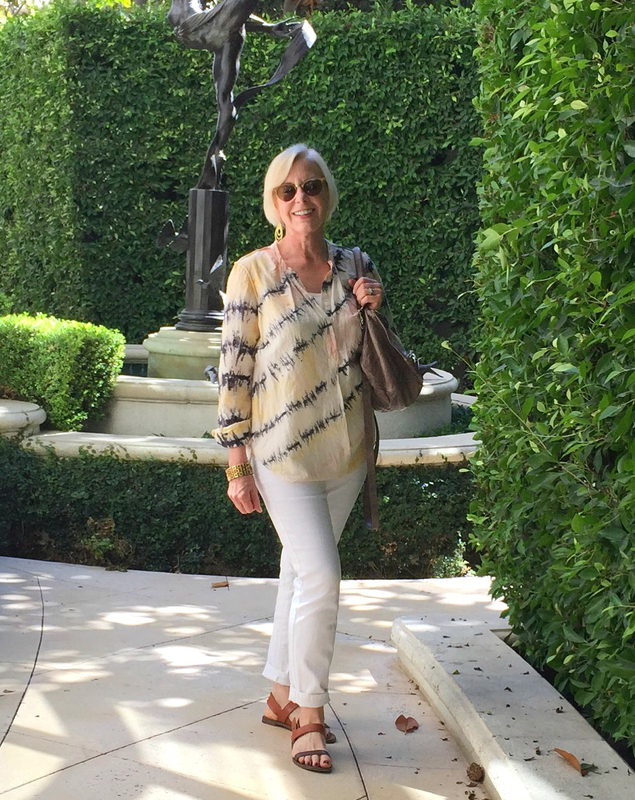 Show us how you style a tunic top or tunic dress. Whether it’s long or short-sleeved, with a collar or without, and includes lace, embroidery, embellishment or is a solid color, we can’t wait to see what you’ll do with your tunic! Send photos to us at howiwearmy@yahoo.com by July 11, 2016 and be sure to tell us a bit about your outfit. Do swing by Adrienne’s to see the other glamorous vacation or resort looks. Thank you for another great HIWM month. I love your striped top - used to have one like that, I wonder what happened to it? 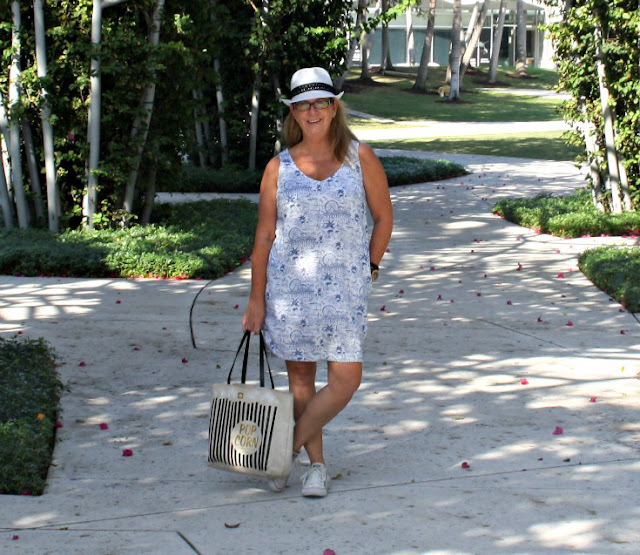 I love all the different takes on vacation looks from shorts to maxi dresses. See you next time for Tunics! Thank you very much for featuring me again! As for Italy - I wish it was luck! It took me a long time and lots of hard work to get here, as it's very, very difficult to travel and apply for scholarships and international projects with Ukrainian passport. I love seeing everyone's interpretation of this month's theme!! Living in NYC is actually one of our fave vacation destinations---so you're living the dream!! So many unique varied looks for travelling. I couldn't participate this time as I was away celebrating my 50th as well...seems like Jacqueline and I almost have the same birthday. Thank you so much for yet another great HIWM series Jill! 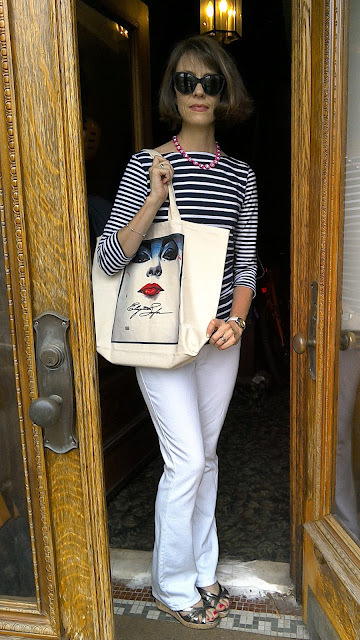 I love your stripe tee and the tote is so fun. 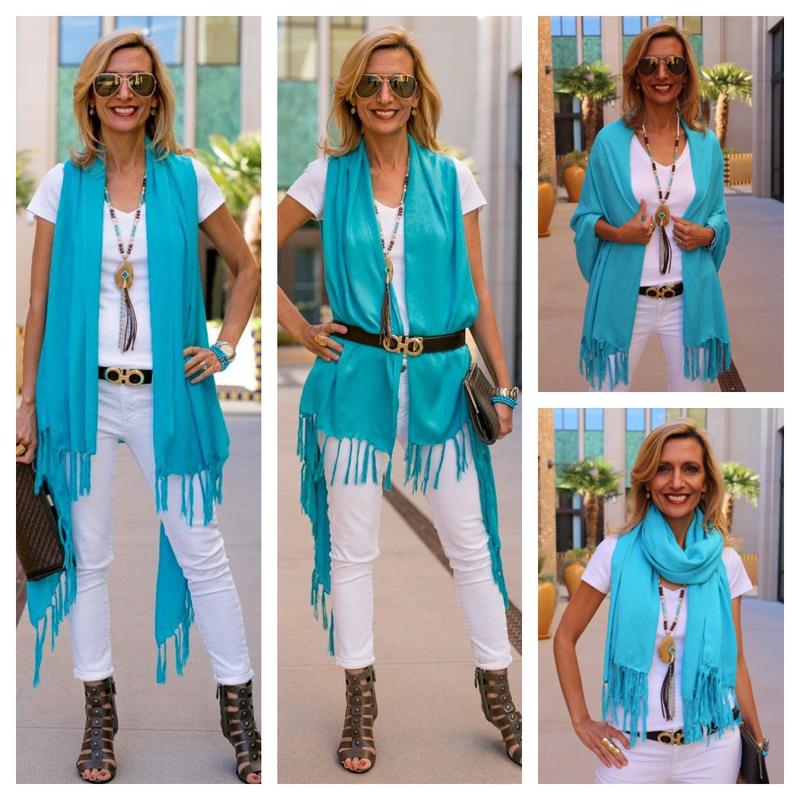 You look like you should be in South of France :) Love all the other looks too. You so look the part with your Paris outfit. 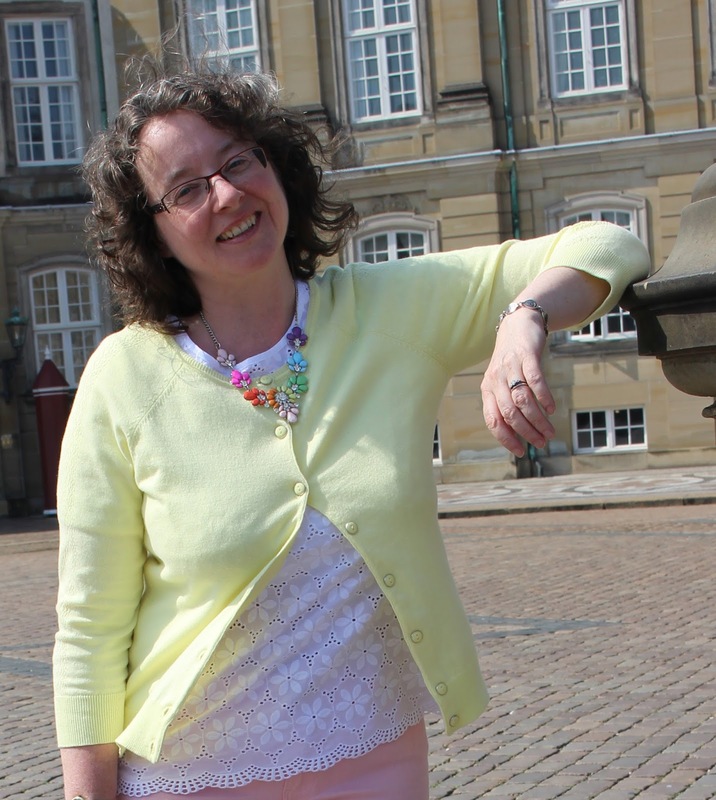 I am in love with Mrs B dress/tunic as I adore lots of bright colours. And of course Catherine's throw-on it perfect too. I admire Nicole for being able to take everything with her in one bag. I always need a trunk. Everyone is so lovely in their gorgeous vacation styles! And oh boy, tunics are my thing! I am so excited for next month's HIWM! Very good assortment here with lots of colour, texture, & hats...standing out to GSL's keen eye are Jodie's stylish sense of thrift and Ana doing Old Glory proud with that fab colour combo. 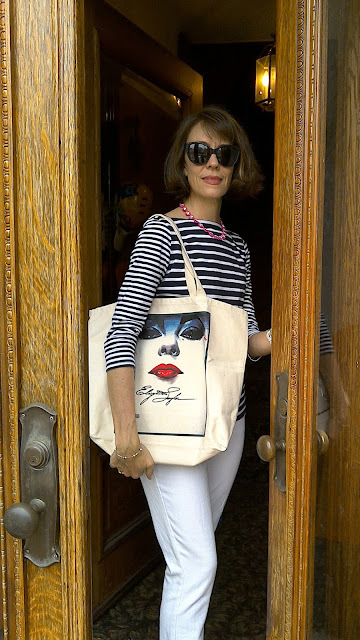 Jill, the Mrs Fortensky bag's return engagement (she has had a few) looks quite nice with those white jeans & striped top with a smile trying to peek thru that Park Slope Hauteur...Miya also in mid-season form. You are wearing one of my favorite combos - a striped tee & white jeans. And that Liz tote is everything. 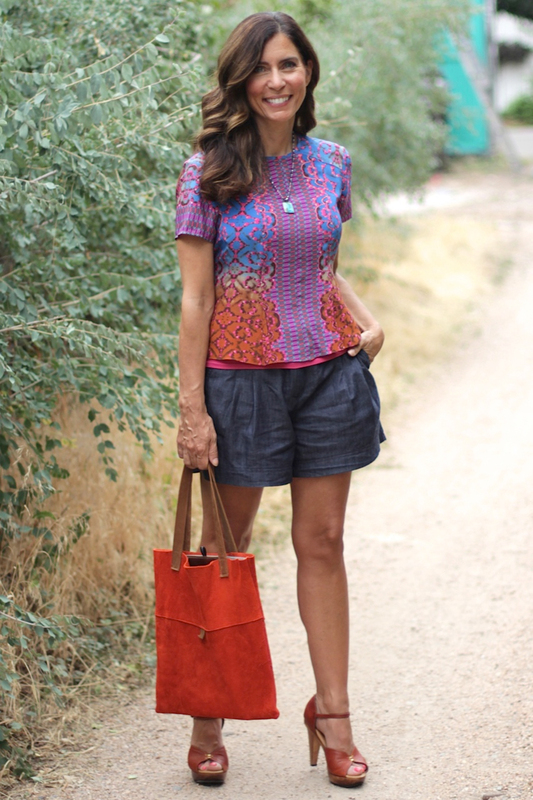 So many great looks, I love your fun tote with this look! 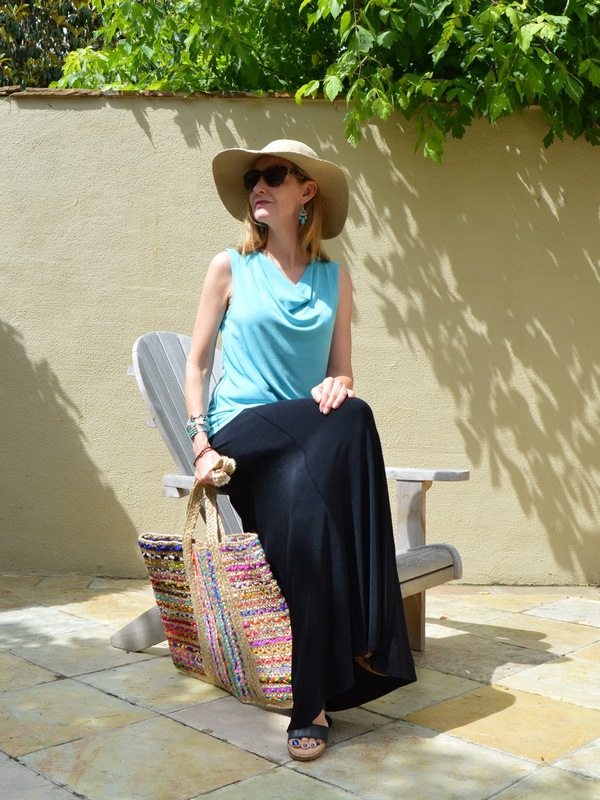 Love your look, Jill...the tote is great! What a fun theme this was! Loving all the pretty vacation-looking photos! Sorry I'm slow stopping by this month, but here I am! Thanks for hosting this fun party! My apologies Jill for not replying until now. Thank you so much for including me in your collective photo for this month's series. What a lovely surprise that was. 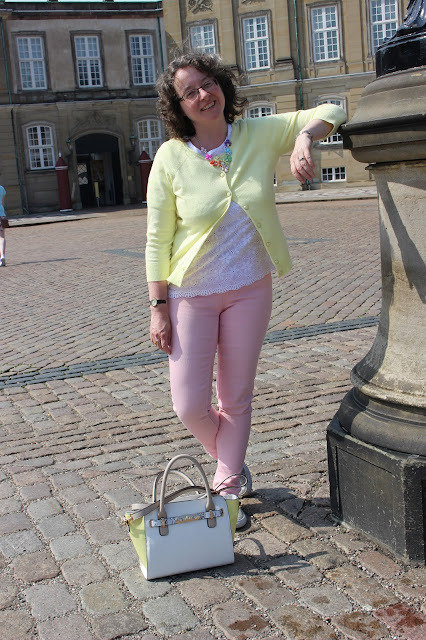 I'm so glad you liked my necklace - the different colours makes it the perfect one to wear on holiday as you can just pick out on of the colours from it to co-ordinate! I knew this month would be a bumper crop and I've really enjoyed seeing all the diverse holiday looks. And I love your bag - the perfect accessorise especially as it's Liz! Jill my apologies for not commenting till now, I'm so behind!! 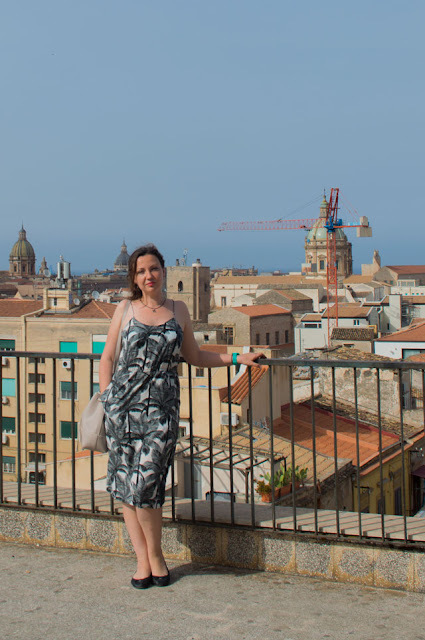 Thank you for featuring my kaftan and bikini - as a Brit chances to wear such floaty summery pieces are few and far between, so we save these outfits for our summer hols! !